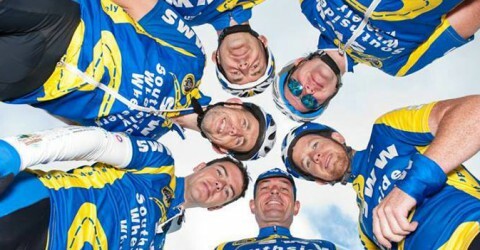 2011 Cycling Coaching for Southside Wheely Wheelers club cyclists, Cycling Ireland Coaching presentation by Tom Shanahan will take place at 7pm Tuesday 18th January in the Deebert Hotel Kilmallock, meeting room upstairs. More info on our Coaching Page…..
New Club Crest design completed and will be available shortly as a car sticker for all club members. Pink for lady cyclists and blue for the gents. 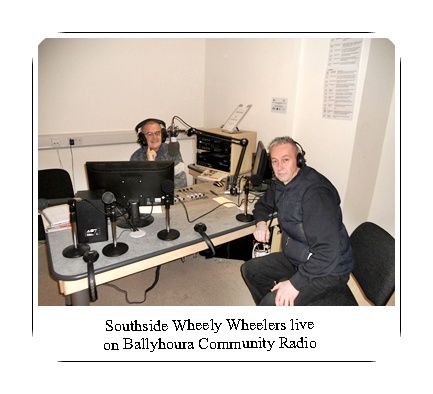 Southside Wheely Wheelers live on Ballyhoura Community Radio. Club P.R.O. went on live radio to publicise our new cycling club. Southside Wheely Wheelers was well represented and all aspects and future activities were discussed. Southside Wheely Wheelers have been asked to do a live monthly update during our cycling season and it was an honour for our new cycling club to be asked on the show. 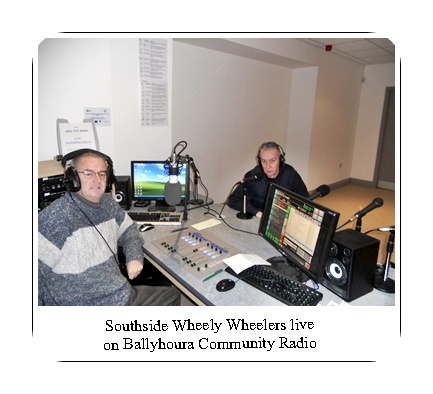 Southside Wheely Wheelers would like to thank Ballyhoura Community Radio for their support on local cycling and our new cycling club. Sunday 12th December Training cycle had two groups cycling, one group started at 8.30am and arrived back to the Kilmallock Castle car park to join the second group start at 9.30am. The first group of cyclists encountered some icy roads on smaller roads via Bruff to Bulgaden and the main group decided to keep to main roads. This was a wise safety decision. Cyclists completed a welcomed leisurely 80kms and the discussion in the bunch while cycling was “how good it was to be back on the bike cycling after the bitter cold few weeks that prevented us from cycling”. Club cyclists also got out for a cycle on Saturday morning and others on Saturday evening to make the best of the improving weather. Out cycling Sunday were Jerry Ryan, Sean Burchill, Tadhg Murphy, Paul Gammell, Shane O’Brien, Gerard Finn, Paul Ahern, Brendan Houlihan, Stephen Finn, Patrick O’Donnell, Michelle Gammell, and Ber Gammell. Southside Wheely Wheelers cycling club held a bag packing weekend in Ryan’s SuperValu Kilmallock. Our cycling club would like to thank Ryan’s SuperValu Kilmallock for accommodating our cycling club by allowing us to bag pack on Friday 3rd and Saturday 4th December. Southside Wheely Wheelers cycling club would like to thank everyone who gave so generously to our cycling club. Finally Southside Wheely Wheelers cycling club wish to thank our cycling members and relations who bag packed for hours at the tills. Thank you. New cycling clothing design is near completion. Please contact Paul a.s.a.p. as first order will be submitted to the manufactures next week.